252 pages | 343 Color Illus. "Anyone looking for a comprehensive introductory textbook on video production will find this to be the perfect fit for their needs. This book tackles both technical and creative aspects of media production, and provides useful visual examples as well as case studies for each subject approached. The updated second edition is successful in adding information about new technologies to this solid piece of writing on the fundaments of video making." Ronald J. Compesi is Professor Emeritus in the Broadcast and Electronic Communication Arts Department at San Francisco State University, where he taught for 38 years. In 2007, he was recognized as the outstanding Media Arts Professor in the California State University System. 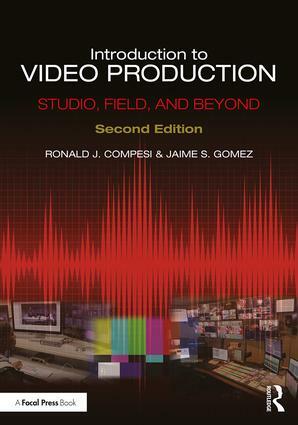 Compesi is also the author of Video Field Production and Editing, in print since 1985. Jaime S. Gomez is Professor of Communication in the Communication Department at Eastern Connecticut State University, where he has taught for 19 years. Gomez has worked on international video productions as a director and cameraperson in countries such as Panama, Spain, Colombia, and the Middle East.